Mix all ingredients first. Add sliced beef strips to the marinade. Put in refrigerator and marinate for 12 to 24 hours. Once it has marinated, take it out of the refrigerator and pour in a strainer to drain off the liquid. Place strips of beef on a plate and dab with paper towels until it is pretty dry. 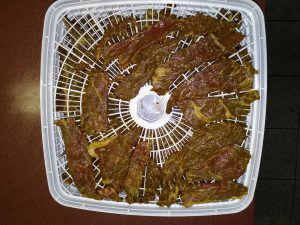 Lay the strips of beef on the trays in single layers in your dehydrator. Sprinkle extra Garlic Habanero seasoning and Black pepper on meat. 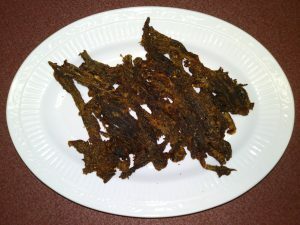 Close the lid and set the settings for beef jerky; using my dehydrator, it’s 160° for jerky. Turn it on and check it in about 6 to 8 hours.